The reason I bring this up is that I do believe you should price your services differently based on different industries. As an example, a few weeks ago I was at a networking meeting with a group of other small business owners, and the featured presenter was the former CEO of a large industrial metals company. They produced everything from automotive steel to aerospace materials to fine-grade machine tools. His comment was that they priced differently by sector, region, and country, and they would have been foolish to do otherwise. I do think that even though freelance writing, freelance editing, freelance graphic design aren’t commodities the way that steel is, there are price differences that occur between industries and client levels. For example, you’re probably not going to have the same budget latitude with a nonprofit charitable organization as you are with a large healthcare group, law firm, investment bank, architect, or some other high-paid professional. The thing you need to think about is: What will that high-paid professional or organization be able to do with your services? They’re going to be able to leverage it for a lot more money, when you think about what their rates are in the market versus the charity. The main argument I can think of against pricing your services differently is, of course, that it’s complicated and you need to keep track of the different rates. It also makes it difficult to, for example, put together a rate sheet–but then again I’m not a big fan of rate sheets anyway. Or, maybe you have a nagging sense that it’s not fair to charge different clients different amounts because the end product is the same. I like to keep things as simple as anybody. I have a price I won’t go below, and I have usual range that I tend to stay between. But I would never box myself in on the upper range. Maybe this is an outlandish, winning-the-lottery type thing, but what if a billionaire came to me and wanted me to ghostwrite his life story? I have to think I would charge that a bit differently. In the end, you have to consider what kind of client you’re talking to, and what they’re going to be able to do with the service you provide them, before you ever put a price on what your talent is worth. In the comments: What’s your philosophy on freelance prices? One size fits all, or tailored project by project? 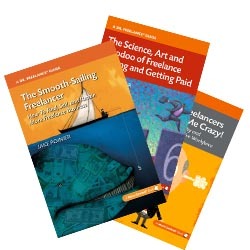 If you haven’t already downloaded it, please make sure to grab your free ebook copy of The Smooth-Sailing Freelancer: How To Find, Sell, and Retain More Freelance Business.